I’m bringing back my “high-end design for real life” series with a new name today but still centering around the same concept. (The title always seemed a little long. . .) It’s all about studying grand ideas from grand homes decorating with grand budgets and applying it–in a practical way–to our own homes. (You can catch up on my previous posts here, here and here.) Today, I’m tackling the colorful and eclectic entryway of Atlanta lifestyle expert Danielle Rollins. I was mesmerized by her home and this small peek of her foyer. Since most of us don’t have a sprawling entryway (or husbands who will jump on board with birds and botanicals covering every square inch of our walls), this is how I would scale down the design. 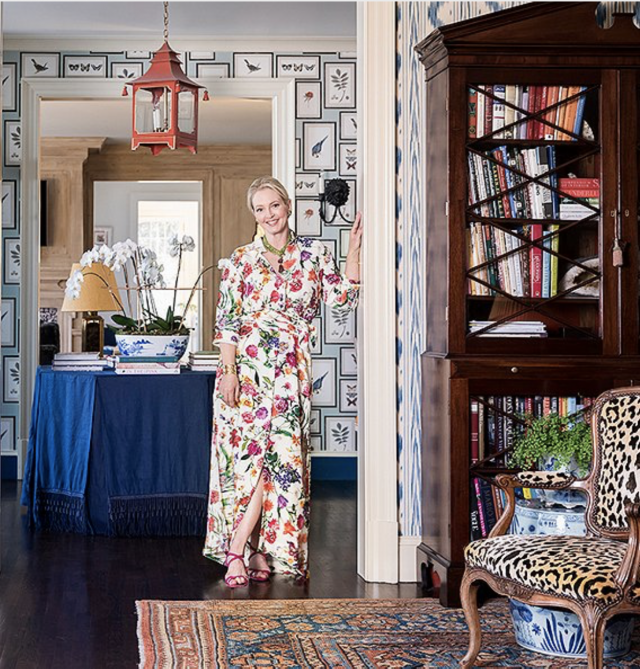 I love all that’s going on here and also pulled some elements in from her living room as seen in the photo. Mantel Decorating: Colorfully Eclectic Or Stylishly Restrained? So good, Emily! I love this one!! This was a great post Emily! I have seen several articles about this particular house and decorating style and, for me, it is so busy I can’t appreciate anything other than I couldn’t relax in this style of room. What you did captures the essence without being overwhelming. Please do it again! I LOVE your interpretation but the original is nothing short of a cacophony . Money does not mean style. It hurts my eyes. These post are my favorite. I find myself flipping through Architectural Digest going now how would Emily scale this for real life? this one is so good! thank you! Some of those AD houses would be hard to scale down… But could be a fun challenge! I agree with the commenters who prefer your redesign. The original is too much for my tastes. Yours is just right. This was great! Could you do one of these posts on Coco Chanels Paris apartment? There are photos all over pinterest and I am quite obsessed with her sense of style.